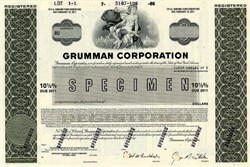 Beautiful engraved RARE specimen certificate from the Grumman Corporation dated in 1986. 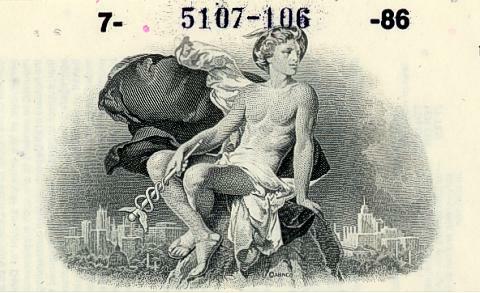 This historic document was printed by American Bank Note Company and has an ornate border around it with a vignette of an allegorical man. This item has the printed signature of the Company's President, George Martin Skurla and is over 21 years old. Originally formed in California in 1939, Northrop Corporation was reincorporated in Delaware in 1985. In 1994, Northrop Aircraft merged with Grumman Aerospace to create the company Northrop Grumman. Both companies were previously established in the airplane manufacturing industry, and Grumman was famous for building the Apollo Lunar Module. The new company acquired Westinghouse Electronic Systems in 1996, a major manufacturer of radar systems. Logicon, a defense computer contractor, was added in 1997. Previously, Logicon had acquired Geodynamics Corporation in March 1996 and Syscon Corporation in February 1995. Upon graduation from the University of Michigan in 1944, George Martin Skurla began his 42-year career at Grumman as an apprentice engineer. He worked on many projects including the Aerobilt trailer bodies, but he will be most remembered for heading up the Florida operations for the Lunar Module. In 1973, Skurla became general manager of Calverton operations and revitalized production of the F-14 Tomcat. Elected president of Grumman Aerospace Corporation in 1974, he held this post until becoming president of the parent organization, the Grumman Corporation, in 1985. Skurla retired in 1986. Northrop Grumman Corporation (NYSE: NOC) is an aerospace and defense conglomerate that is the result of the 1994 purchase of Grumman by Northrop. The company is the third largest defense contractor in the world, and the number-one builder of naval vessels. As of 2005, it had 123,600 employees working at numerous sites in the U.S. and abroad, and an annual revenue of US$30.7 billion. Northrop Grumman ranks #67 on the 2006 Fortune 500 list of U.S. industrial companies. Some of the most expensive vehicles in the world, such as this B-2 Spirit strategic bomber, are made by Northrop Grumman and purchased by the United States government. A BQM-74 Chukar unmanned aerial drone launches from a U.S. Navy vesselSeparate sectors, such as Integrated Systems, produce aircraft for the U.S. and other nations. The B-2 Spirit strategic bomber, the E-8C Joint STARS surveillance aircraft, the RQ-4 Global Hawk, and the T-38 Talon supersonic trainer, are used by the U.S. Air Force. The US Navy uses Northrop Grumman-built aerial vehicles such as the BQM-74 Chukar, C-2 Greyhound, E-2 Hawkeye, and the EA-6B Prowler. Northrop Grumman provides major components for aircraft such as F/A-18 Hornet. Many aircraft, such as the F-5, T-38 Talon, and E-2 Hawkeye are used by other nations. The Space Technology sector builds a variety of military and NASA satellites and mission payloads, as well as various Strategic Defense Initiative ("Star Wars") defensive laser systems. Working with Boeing, the sector provides the chemical laser for the Boeing YAL-1 Airborne Laser system. Mission Systems sector is engaged in supporting the U.S. ballistic missile program; integrating various command, control and intelligence systems; and providing technical and management services to governmental and military customers. Northrop Grumman intends to bid for the U.S. Air Force's next-generation strategic bomber project. Though it has not built a large manned aircraft since wrapping up B-2 Spirit production in the 1990s, the company has "been working hard to turn that perception around, with the skills and capabilities that back it up." Northrop Grumman Electronic Systems creates C4I radar systems for air defense, and Airspace Management radar systems air traffic control. Other sensors produced by this unit are used on F-16 Fighting Falcons, F-22 Raptor, F-35 Lightning II, B-1 Lancer and other military aircraft, or in battlefield surveillance systems like the Airborne Reconnaissance Low (ARL). Remotec, a subsidiary, is the foremost manufacturer of remote control vehicles for explosive ordnance disposal and hazardous material handling. Many other smaller products are made by Northrop Grumman, such as night-vision goggles and secure communications equipment. They also have worked closely with Antenna Associates, Inc., a leading manufacturer of IFF(Identification Friend or Foe)/SSR(Secondary Surveillance Radar) Antennas located in Massachusetts. Electronic Systems also produces and maintains the AWACS aerial surveillance systems for the U.S., the United Kingdom, and other customers. A UK-based subsidiary, Park Air Systems, makes navigation, traffic control, and communications equipment for international customers. In addition to providing the products created by Northrop Grumman, the company also provides many military and non-military services, usually to governments. It is among the largest suppliers of IT services to the U.S. federal government, for instance. And Vinnell, a Northrop Grumman subsidiary within the Technical Services sector, provides training and communications services for the military. Many smaller nations and individual states in the U.S. have contracted Northrop Grumman for various large-scale projects. In 2005, for instance, the company won a $2 billion contract with Virginia to overhaul most of the state's IT operations. And later that year, Great Britain paid for a $1.2 billion contract with the company to provide maintenance of many aspects of the country's defensive radar. Northop Grumman also performs various foreign functions in the War on Drugs. The company sends planes to spray herbicides on suspected cocaine fields in Colombia and opium poppy fields in Afghanistan. A merger between Northrop Grumman and competitor Lockheed Martin was not approved by the U.S. government in 1998, slowing the consolidation of the defense industry. But in 1999, the company acquired Teledyne Ryan, which developed surveillance systems and unmanned aircraft. It also acquired the California Microwave, Inc., and Data Procurement Corporation, in the same year. Other entities acquired included Inter-National Research Institute Inc. (1998), Federal Data Corporation (2000), Navia Aviation As (2000), Comptek Research, Inc. (2000), and Sterling Software, Inc. (2000). In 2001 the company acquired Litton Industries, a shipbuilder and provider of defense electronics systems to the U.S. Navy. During the acquisition process, a new Delaware holding company, NNG, Inc., was formed. It merged with Northrop Grumman through a one-for-one common shares exchange in April 2001. Both Northrop Grumman and Litton became subsidiaries of the new holding company. The original Northrop Grumman Corporation then changed its name to Northrop Grumman Systems Corporation; the holding company, NNG, Inc., changed its name to Northrop Grumman Corporation. Later that year, Newport News Shipbuilding (one of only two producers of nuclear submarines) was added to the company. And in 2002, Northrop Grumman acquired the maximum amount possible of TRW without placing JCP out of majority ownership, with their sole interest in their space systems and laser systems manufacturing. The Aeronautical devision was sold onto Goodrich and the automotive section being spun-off and remaining as TRW. There have been many other smaller acquisitions throughout the same period. Northrop Grumman and Boeing have also recently collaborated on a design concept for NASA's upcoming Orion spacecraft (previously the Crew Exploration Vehicle), but that contract went to rival Lockheed Martin on August 31, 2006. Northrop Grumman announced formation of a new business unit (sector), effective January 1, 2006 called Technical Services. Northrop Grumman was named Forbes's Company of the Year in 2002. Forbes's announcement credited the company with "master[ing] the art of innovation." Northrop Grumman no longer appears on their list of America's 400 Best Big Companies, however. Northrop Grumman is credited with sponsoring educational programs and donating thousands of dollars to various charities. Many members of the U.S. government have attended company events and spoken highly of the company and its contributions. Northrop Grumman has had to deal with multiple scandals during its history. The company was sued in 1999 for knowingly giving the Navy defective aircraft. This suit seeks $210 million in damages and is ongoing. Then in 2003, the company was sued for allegedly overcharging the U.S. government for space projects in the 1990s. Northrop Grumman paid $111.2 million to settle that suit out of court. Northrop Grumman also landed a $48 million contract to train the New Iraqi Army, a job that many have complained has been poorly managed. Kent Kresa was the CEO of the company until he was required to retire in 2003 due to age restrictions. At this point, Ronald Sugar, formerly the chief operating officer, took over as CEO. He also serves as the company chairman. Besides Sugar, current members of the board of directors of Northrop Grumman are: John Chain, Lewis Coleman, Vic Fazio, Stephen Frank, Phillip Frost, Charles R. Larson, Richard B. Myers, Philip Odeen, Aulana Peters, Kevin Sharer, John Brooks Slaughter. The company is split into several business units, each of which operates fairly independently. These business units have generally been created through acquisitions. Northrop Grumman Electronic Systems was created by Northrop Grumman's acquisition of Westinghouse Electronic Systems Group in 1996. The Electronic Systems sector is a leading designer, developer, and manufacturer of a wide variety of advanced defense electronics and systems. The division has 120 locations worldwide, including 72 international offices, and approximately 24,000 employees. It accounted for 20% of company sales in 2004. Electronic Systems is headquartered in the Baltimore metropolitan area. Information Technology is the sector charged with providing information systems and services to clients. It also handles training and simulation contracts. Mission Systems deals with missile systems, command, control and intelligence, as well as technical and management services. Integrated Systems support the aerospace and defense industries, providing the U.S. military with intelligence, surveillance, reconnaissance, and integrated strike warfare. Northrop Grumman Newport News is the largest privately owned shipyard in the United States and the only one that can build Nimitz-class supercarriers. It is located in Newport News, Virginia, and often participates in projects with the Norfolk Naval Shipyard in Portsmouth, Virginia. Northrop Grumman Ship Systems is responsible for building small and medium shipping products. It consists of the former Ingalls Shipbuilding and Avondale Shipyard companies. Space Technology deals primarily with satellites, and SDI systems. Technical Services is a new business unit formed January 1, 2006. Northrop Grumman describes the sector as working in "the logistics support, sustainment, and technical services marketplace."